After two days of delay caused by bad weather and a technical glitch, NASA is once again ready to launch two probes toward the moon to unlock the secrets of lunar gravity. 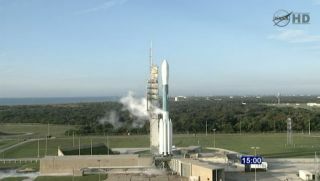 The twin Grail spacecraft are expected to launch from Florida's Cape Canaveral Air Force Station today (Sept. 10) at 8:29 a.m. EDT (1229 GMT), with a second opportunity available at 9:08 a.m. EDT (1308 GMT), if needed, NASA officials said. The $496 million moon probes were initially slated to launch atop their unmanned Delta 2 rocket on Thursday (Sept. 8), but unacceptable high-altitude winds forced NASA to delay the liftoff. Today's weather forecast is more optimistic, and current predictions show a 60 percent chance of acceptable conditions at the time of launch, agency officials said. NASA has specific limits for acceptable launch weather conditions, with high winds, rain, thunder and lightning all present potential safety risks. For example, high upper level winds can affect the way rockets fly through Earth's upper atmosphere as they blast into orbit. The twin Grail spacecraft, called Grail-A and Grail-B, will closely examine the composition of the lunar interior, and will make detailed and precise maps of the moon's gravitational field. The three-month mission is expected to help scientists solve mysteries of the moon's origin and its evolution since the natural satellite was formed 4.6 billion years ago. Researchers are also hoping to use Grail's observations to better understand how other large, rocky bodies in the inner solar system were formed.